The P-CHARGE System is a complete series of charging stations for electric vehicles, catering for the most diverse of requirements both in private and public areas. From the simple charging pillar for electric bicycles, mopeds and electric cars to complete parking area systems for department store chains, communal park houses and parking areas, through to complete charging and billing systems of the future. 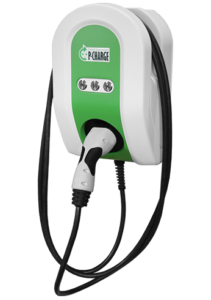 The P-CHARGE system can be configured to the individual needs of the customer. Each pillar is equipped with the appropriate socket systems depending on the specification. 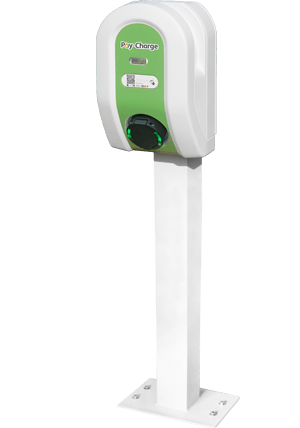 With Pay-Charge, we have launched a charging station for public and commercial applications: stepless charging from 3.7 kW to 22 kW *. All modern electric vehicles can be charged with a charging control according to IEC 6185122. The charge controller is state of the art. The entire control technology is housed in a weatherproof and robust housing. A stand made of galvanized steel with plastic coating ensures firm stability. Pay-Charge is also very suitable as a wall-box solution for wall mounting, z. B. in parking garages. * The actual charging power depends on the respective electric vehicle and the power supplied by the network operator.